Here’s a neat little project I just stumbled upon. For those DIYers, this is a useful project if you like backpacking or camping. Constructed from pieces of aluminum soda cans, this versatile camp stove burns alcohol to produce its heat and resuses materials that would otherwise be discarded or recycled. For my first attempt I carved up a couple of Coke cans paying little attention to making clean cuts and exact measurements and the initial set up was less than successful. However, with a little care, particularly to making clean cuts by peeling the can along scored marks, the second iteration was far more successful and more rigid. 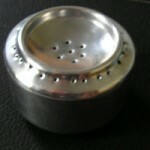 For complete instructions on making your own handy alcohol stove from soda cans, consult: http://zenstoves.net/Stoves.htm. The author discusses various construction practices and fuels used, as well as safety hazards of each design. The model I constructed (above) is known as a pressurized jet alcohol stove, which uses a metal insert to preheat and vaporize the fuel, pushing it out through the top jets. Open burners and pressure-regulated burners can also be similarly constructed with soda cans, tuna cans, or Altoids tins. This entry was posted by admin on April 12 at 7:46 pm, and is filed under Outdoors/Camping. Follow any responses to this post through RSS 2.0. You can leave a response or trackback from your own site.